Diabetic neuropathy or diabetic nerve pain is a group of nerve disorders caused mainly due to diabetes. The people who suffer from diabetes can develop nerve pain over time and this goes for the entire body. There are no symptoms experienced by some people while there are others who might experience symptoms like numbness, tingling, loss of feeling and pain in the arms, hands, legs and feet. Around 60 to 70 percent people suffering from diabetes also tend to suffer from nerve pain. The damaged nerves cannot be replaced but there are a number of ways that can effectively be used for preventing further damage and relieving the pain. Controlling the level of blood sugar in the body can be of good help in treating diabetic nerve pain. Appropriate measures should be taken in setting blood sugar goals and it is also important to learn the procedure of monitoring the blood sugar level. Medicines, proper diet and exercises are effective tools used for lowering the blood sugar. Over-the-counter pain relievers like aspirin, ibuprofen and acetaminophen can also be used for controlling diabetic nerve pain. Antidepressants used for treating depression can also be effective for diabetic nerve pain. This is because they interfere with the chemicals in the brain that make you feel the nerve pain. 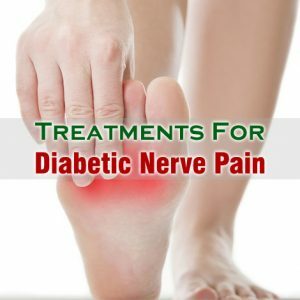 Another effective diabetic nerve pain treatment is acupuncture that helps in relieving the discomfort felt throughout the body due to nerve pain. The process involves inserting very thin needles throughout the body painlessly at different points for relieving pain. Quitting the habit of smoking and having a healthy and nutritious diet are some lifestyle changes that can help in alleviating diabetic nerve pain. Being active throughout the day is also a healthy habit which relieves nerve pain. Physical activities like swimming and low-impact exercises can treat diabetic nerve pain in the best way possible. Increased physical activities not only help in controlling diabetic nerve pain but also help in improving overall fitness.